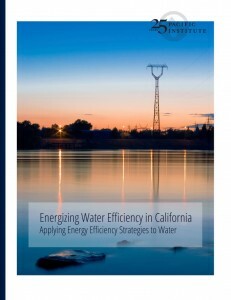 As a dry December accentuates the stress on California’s limited water supplies, the success of the state’s energy sector in implementing efficiency programs offers valuable lessons to the water sector. A new report from the Pacific Institute examines the rules, regulations, and policies that promote energy efficiency and finds models for water management in drivers like the energy sector’s appliance standards, building codes, pricing policies, and utility-sponsored efficiency programs. California has made remarkable improvements in energy efficiency over the last several decades and is recognized as a national leader. The state’s per capita electricity and natural gas consumption is about 45% and 30% less, respectively, than other Americans. Indeed, California’s per capita electricity consumption has remained largely unchanged since the mid-1970s – while increasing by more than 50% across the U.S. Efficiency policies, including incentive and education programs, have been a major factor in reducing per capita energy use in California. In water conservation and efficiency, California has also made major advances. Many urban areas across the state, including Los Angeles and San Francisco, are serving a larger population with the same or even less water than 20 years ago. But with increasing pressure on water supply from population and economic growth, the need to restore freshwater ecosystems, and climate change, greater water conservation and efficiency are essential. The Pacific Institute report identifies programs that have worked for the energy sector and offers recommendations for how they could be adapted to the water sector. First among them are to continuously update standards and codes for fixtures and buildings to capture new technologies and practices. A second recommendation is to implement more effective pricing policies for water and wastewater. Tiered pricing is becoming increasingly common among water utilities in California, but is not nearly as widely employed as in the energy sector. Furthermore, the majority of California wastewater utilities use flat rates that provide no incentive to conserve because customers are charged the same amount regardless of the amount of wastewater generated. Tiered pricing has been shown to send a price signal to reduce use and can be used by far more water and wastewater utilities in California.